“Design and the Elastic Mind” exhibition opens February 24th, 2008 at New York’s Museum of Modern Art (MoMA). 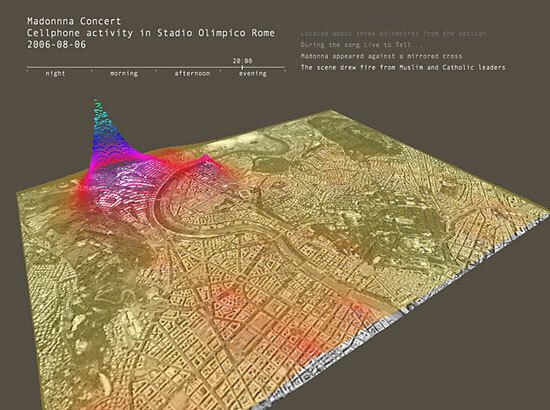 The Real Time Rome project is included in the exhibition catalogue. The exhibition, curated by Paola Antonelli, focuses on designers’ ability to grasp momentous changes in technology, science, and social mores, changes that will demand or reflect major adjustments in human behavior, and convert them into objects and systems that people understand and use. The exhibition highlights examples of successful translation of disruptive innovation, examples based on ongoing research, as well as reflections on the future responsibilities of design. If you are around NYC, you don’t want to miss it! I might go to New York for this! Let me know when you come here Cati, we can check it out together, opening night was just too crowded.